Betat – Hot Summer Offers / Week 4! Enjoy sunny Free Spins, Super Spins and Cashback! Longer days, balmy evenings, sand, sea and sunshine. 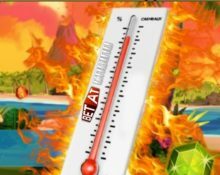 Get ready for another scorching summer week at Betat as their “Hot Summer” campaign is heading into its 4th week. Starting each Monday in July, players can claim new rewards for Free Spins and cash back prizes on some of the hottest game in their portfolio. Get your flip-flops and sunshades as it is going to be another exciting seven days. It is finally summer and the next lasting memories are just waiting to happen. Every week in July, Betat Casino will be releasing awesome promo codes, where every players can enjoy Free Spins or Super Spins on some of their fantastic games. Each code can be used once per player, Free Spins are instantly credited after the deposit is completed. Wagering requirement is 15x FS winnings. Ready…. Set… Summer! The scorching heat is on and Betat Casino is cranking up the excitement with an awesome Cashback on some of their hottest games. Opt-in to ‘Heat Wave’ now to get a sunny cashback on net losses should Lady Luck not shine on you. A deposit during the week is needed to qualify for this offer. Minimum cashback is £/$/€ 10, maximum is £/$/€ 50, credited on 31st July with a 15x wagering requirement.